…Poseidon’s court! Any hot crustacean bands or Muses who want to be a part of someone’s world will be entirely coincidental. Now, as you can see, the voting was really close. 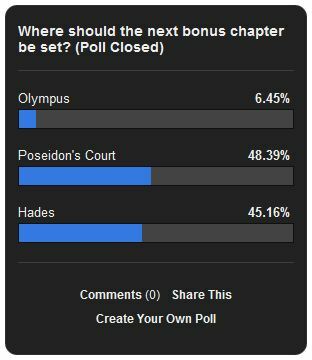 Poseidon just barely pulled ahead of Hades in the end. That’s why I’ve also outlined a Hades bonus chapter which will be posted after the Poseidon story. It will be set in the Underworld and will feature a lot of Hades himself. Check back next week for some canon mythological background about Poseidon and Amphitrite, their kingdom, and their family. The Poseidon bonus chapter will be posted some Monday in October, though I can’t say which one. Thanks for voting! This entry was posted in Amethyst's Musings and tagged Amethyst's Musings, feedback, poll results, polls. Bookmark the permalink.